Dry skin can occur for many reasons. Sometimes, it can be genetic, forcing individuals to deal with the chronic problems associated with dehydrated, dry and irritated skin. It is common for dry skin to be sensitive and sometimes painful, often becoming flaky and itchy. Treatments for this problem can range from quick, temporary fixes to longer-term remedies that can correct your skin's health and prevent further dehydrated skin. The chemicals found in skin cleansers can often damage your skin by tapping it of water and nutrients. According to the Mayo Clinic, these cleansers should be avoided in favor of soaps and creams advertised as gentle skin cleansers, particularly those featuring added moisturizers. Soaps with added oils and fats will also prevent harsh treatment of your skin. Deodorant detergents and antibacterial products are harsh on your skin and should be avoided. If your skin feels tight or dry after using a particularly product, it's likely the product is draining your skin of nutrients and should be avoided. Showers may seem like a good hydrating treatment, but they can actually strip oils from your skin and make it more susceptible to dryness. This is particularly true when the temperature of the water is very hot, and/or the length of the showers is excessive. In some cases, you can restore your skin's health by eliminating these harmful factors. Reduce your shower time to 15 minutes or less, and use warm or lukewarm water. When moisturizers are applied immediately after showering, they can help lock in the moisture and topically provide oils and nutrients to the skin, particularly as a means of replacing other oils stripped away in the shower. The Mayo Clinic recommends patting or blotting your skin so that a thin layer of moisture remains. 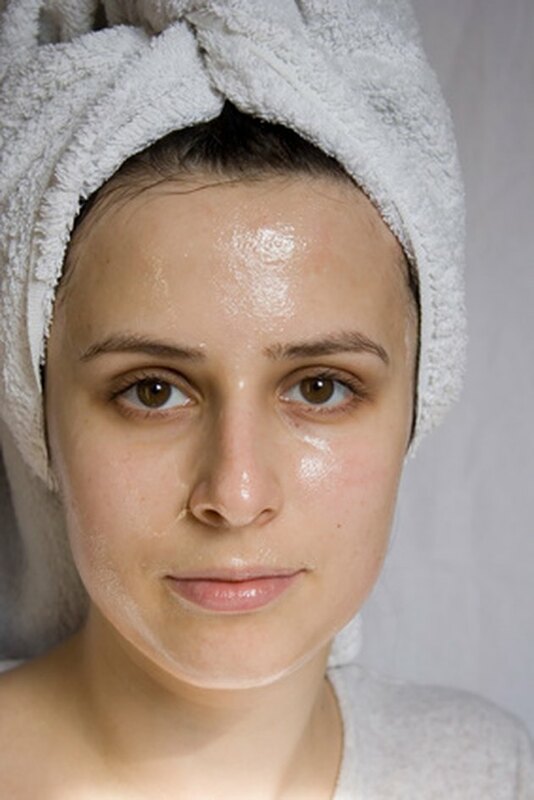 Applying moisturizer over your skin while still wet to get the best results and seal in moisture. When your home's air is dry, it can wreak havoc on your skin. While you may be avoiding the hazards of outdoor factors, you could be slowly drying your skin out through low humidity in your home's air. However, you can change this by purchasing a humidifer for your home. This simple machine emits moisture, making the environment more friendly to dry skin, according to the Mayo Clinic. Keep the humidifier clean to prevent mold and fungi from being dispersed into the air. Is It Possible to Get Rid of Dry Skin in One Day?